I took this photograph on an evening out with some friends and colleagues in Pasadena to see Strike Twelve play at Old Town Pub. We had finished a delicious dinner and needed to kill some time before the show. 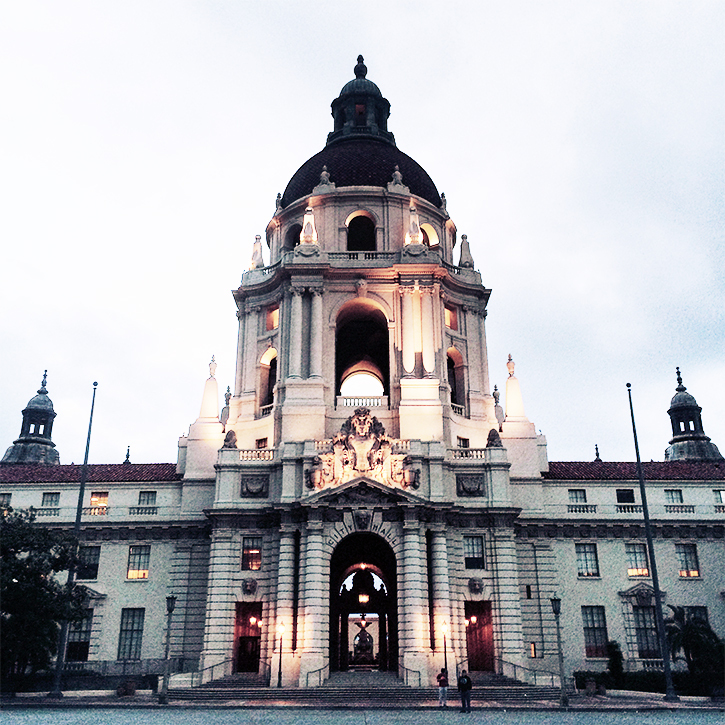 If you watch Parks and Recreation, you may recognize Pasadena City Hall in the establishing shots in the show's Pawnee City Hall. This was taken on my iPhone 5S (which is on its last legs) and cleaned up. This has been the extent of photographic excitement in the past few weeks that don't involve posting pictures of friends who may not want to be plastered on the internet. In other news, I clearly haven't fallen off the face of the Earth and died. Updates have been a bit sparse because I have graduate school things to do. I never don't have things I need to be doing and every day ends with me thinking of how I could've been more productive so make of that what you will. As my friend/colleague says, "Everyone always thinks they could've been more productive and efficient." In any case, I will be back soon (like the end of this week, when things are less hectic). Cheers. Aw sounds like you're busy - good luck with everything! Beautiful architecture in that photo. And don't worry, take your time with your work! Lovely photo! I hope you enjoy the rest of your time as a grad student. I miss the days of being in grad school (or undergrad for that matter) those days fly by so quickly! the photo looks grand *-* wishing everything would go smooth sailing on you! Enjoy the hectic time anyway! I understand how busy you are. Good luck with everything!